Originally published under the title "Turkey Mania: 'Jerusalem is Muslim'." President Recep Tayyip Erdogan's Turkey, not surprisingly, champions the global Islamist war on Trump's move. In a latest show of "solidarity with the Palestinian cause," Turkey spearheaded efforts at a summit of Islamic nations in Istanbul to declare "eastern Jerusalem as the capital of Palestine under occupation." Erdogan said of Jerusalem: "Al-Quds [Jerusalem] has been viewed as the prayer place of Muslims and Christians and, partially ... as if it is the prayer place of Jews." Partially? It is elementary history that Jerusalem's pre-Islamic period of 3300-1000 BCE appeared in the book of Genesis -- the time of Abraham, Isaac and Jacob -- when Erdogan's ancestors were probably hunters in the steppe of Central Asia. The years 1000-732 BCE marked the period of the ancient kingdoms of Israel and Judah. Simply put, Jerusalem's Judaic history dates back to thousands of years before the birth of Islam. By rejecting Jerusalem's Judaic history, in fact, Erdogan is ironically denying that his holy book, the Quran, recognizes the Land of Israel. The Quran does not say that the Israelites originated in Alaska. 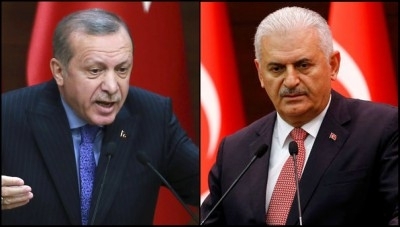 President Recep Tayyip Erdogan (left) and his prime minister, Binali Yildirim. Since Trump's statement on the status of Jerusalem, protesting Israel and the United States has been part of daily life in Turkey's big cities. Producing and selling Palestinian flags must be one of the most lucrative businesses these days. Turkish protesters gather in crowds to chant anti-Jewish and anti-American slogans and carry placards ornamented with Arabic script that they cannot read. They are angry. They threaten to go globally violent. "If al-Quds [Jerusalem] fell, no capital in the world will be safe," a big group of protesters in Ankara warned the world. 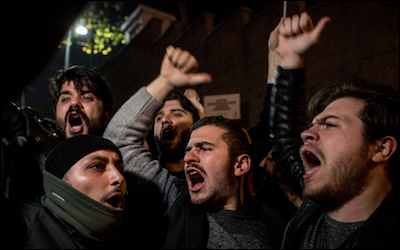 Protesting Israel and the United States has been part of daily life in Turkey's big cities. Erdogan's argument on the international illegitimacy of Jerusalem as Israel's complete and united capital is based on a United Nations Security Council Resolution No. 478, of August 20, 1980, which "condemned in 'the strongest terms' the enactment of Israeli law proclaiming a change in status of Jerusalem and called on all states 'that have established diplomatic missions' in Jerusalem to withdraw them from the city." The U.S. will not retract its decision just because it angered already angry jihadists in Turkey or elsewhere. 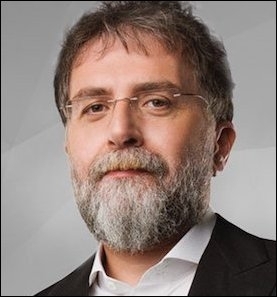 Ahmet Hakan: "The ummah, the Muslim religious community, is tired of the Jerusalem issue." There was such a big crowd in front of the store that if you saw it, you would likely think that it was a political party meeting, and that the party was headed to power. In none of them was there any crowd similar in size to the one in front of the store selling discounted electronic goods... This lack of interest was not only in Turkey; a similar situation was valid everywhere in the Islamic world. There is only one conclusion we can draw from this comparison: The 'ummah,' the Muslim religious community, is tired of the Jerusalem issue. Perhaps because for many years angry groups have been chanting 'Down with Israel' and nothing happens to Israel. The angry slogans and burned flags have been no use for many decades. Most leaders of Muslim-majority countries are wary of the issue, and the Palestinian cause is used in many other countries simply as an outlet to reinforce the ruler. The Middle East is already full of bloodshed that nobody can do anything about.